NAPLES, Fla. /Florida Newswire/ — On Friday, August 17 from 9 a.m. – 2:30 p.m., Ave Maria Law will host an interactive workshop with an exciting line-up of local, talented speakers. Topics of discussion will include, “What I Wish I Knew When I Started,” “Transitioning from Law Firm to Solo Practice,” and presentations on eDiscovery, marketing, financial planning and legal research. * — plus a panel. $45 Ave Law Alumni & Lee and Collier Young Lawyers Division / $95 General Admission. Law Offices of Gary De Pury, P.A., Lutz, Fla.; Law Office of John A. Arceri, Marco Island, Fla.; Verderamo & Nunez, Naples, Fla.; Lindsay & Allen, Naples, Fla.; The Mendieta Law Firm, PLLC, Naples, Fla.
Ave Maria School of Law was founded in Ann Arbor, Michigan, in 1999 and in 2009 relocated to Naples, Florida. Ave Law was named the best Catholic Law School in the United States for the devout three times by The National Jurist’s PreLaw Magazine, winter 2014 and spring 2016 and 2017 issues. Ave Law was ranked #1 Most Diverse Law School in the spring 2016 issue of PreLaw through a quantifiable study. The Princeton Review named Ave Law one of the nation’s most outstanding law schools in the 2015 edition of its annual book, “The Best 169 Law Schools” and again in 2017 & 2018. The Law School was also ranked number one on the “Most Conservative Students” list in the book. Ave Maria Law has earned the 2017 & 2018 Military Friendly(r) School designations by Victory Media, publisher of G.I. Jobs(r), STEM Jobs and Military Spouse. 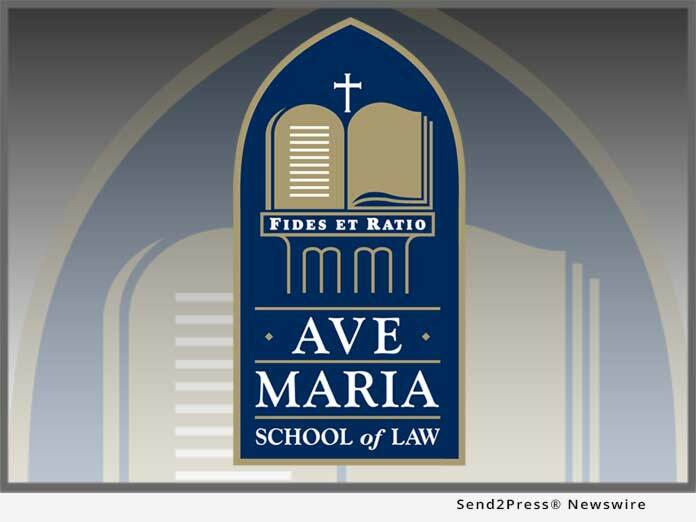 Ave Maria School of Law is licensed by the Florida Commission for Independent Education, License Number 4007 and is fully accredited by the American Bar Association.